Joey is a “cool little dog” who gets around just fine on only two legs, says Doug Smith, supervisor of the California shelter that took the Chihuahua in off the street earlier this month. 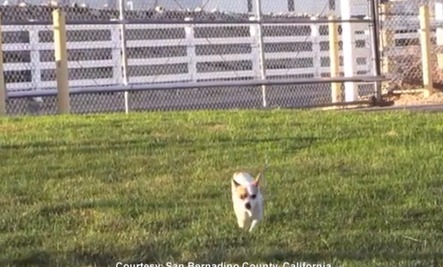 Smith appeared in a video about Joey for San Bernardino County’s Devore Animal Shelter. It was released to the public in an effort to find the dog’s owner — or a potential adopter for him. “He just kind of struck a chord,” Smith told ABC News. He says Joey is “extremely nimble on his two legs.” The shelter staff believes the pooch was born without his right front and left rear legs. When no one came forward to claim Joey after 96 hours, he was officially put up for adoption. That’s when Smith’s 13-year-old daughter, Rodri, saw a TV news report about the special dog. Rodri visited Joey at the shelter and fell in love with the affectionate little guy, who’s about 5 or 6 years old. But Rodri wasn’t the only one who wanted to take Joey home, and Smith wanted to play fair. He joined the shelter’s lottery just like the 20 other potential owners. Joey is now happily at home with the Smith family and their two other dogs. Just so awesome, give me some of your energy little one. You are such happy, lucky doggy Joey, many happy days ahead. Go Joey Go, such an adorable little doggy, great story thank you for sharing. Congratulations to all - to Joey who has a forever home and to his family, who were so lucky to have him. My best wishes for a long and happy life together. Enjoy every moment with this very special once-in-a-lifetime dog!!! !